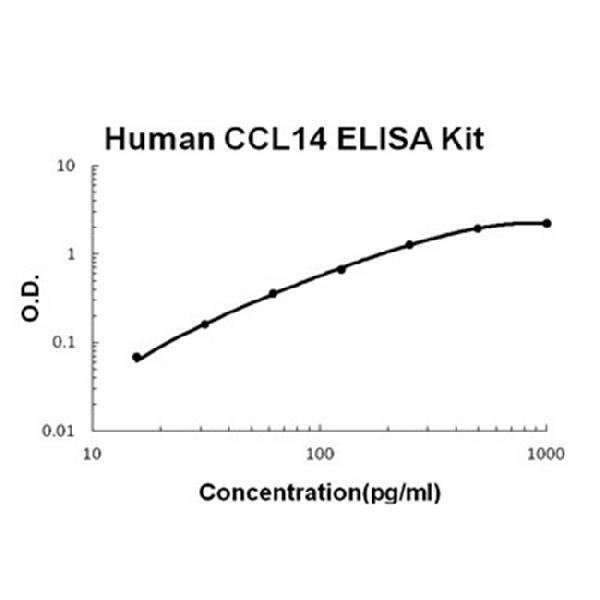 Sandwich High Sensitivity ELISA kit for Quantitative Detection of Human CCL14/HCC-1. 96wells/kit, with removable strips. Expressed constitutively in several normal tissues: spleen, liver, skeletal and heart muscle, gut, and bone marrow, present at high concentrations (1-80 nM) in plasma. .
Has weak activities on human monocytes and acts via receptors that also recognize MIP-1 alpha. It induced intracellular Ca(2+) changes and enzyme release, but no chemotaxis, at concentrations of 100-1,000 nM, and was inactive on T-lymphocytes, neutrophils, and eosinophil leukocytes. Enhances the proliferation of CD34 myeloid progenitor cells. The processed form HCC-1(9-74) is a chemotactic factor that attracts monocytes eosinophils, and T-cells and is a ligand for CCR1, CCR3 and CCR5. .
Chemokine(C-C motif) ligand 14(CCL14) is a small cytokine belonging to the CC chemokine family. It is also commonly known as HCC-1. It is produced as a protein precursor that is processed to generate a mature active protein containing 74 amino acids that and is 46% identical in amino acid composition to CCL3 and CCL4. This chemokine is expressed in various tissues including spleen, bone marrow, liver, muscle, and gut. CCL14 activates monocytes, but does not induce their chemotaxis. In addition, HCC-1 enhanced the proliferation of CD34+ myeloid progenitor cells. It was as effective as MIP-1 alpha, but about 100-fold less potent. Human CCL14 is located on chromosome 17 within a cluster of other chemokines belonging to the CC family. Guo H, Nan K, Hu T, Meng J, Hui W, Zhang X, Qin H, Sui C. Hepatol Res. 2010 Nov;40(11):1107-16. Doi: 10.1111/J.1872-034X.2010.00721.X. Epub 2010 Sep 28. Prognostic Significance Of Co-Expression Of Nm23 And P57 Protein In Hepatocellular Carcinoma.